Sergio Garcia made birdies at his final two holes of round three in gathering gloom at the Emirates Club, the Spaniard moving three shots clear in the Dubai Desert Classic. Garcia, 20-1 ante-post, was in the half of Desert Classic draw who enjoyed by far the best of the conditions, and the Ryder Cup star has taken advantage of his good fortune. No bigger than 8-13 is available about the leader with 18 holes to play. Henrik Stenson, 7-1 market leader at the outset, is Garcia's chief pursuer. Stenson is two shots clear of those tied for third place and a 9-4 chance to overcome the deficit. The Swede was Dubai champion at the Emirates in 2007. Three players – Jason Scrivener, Gregory Bourdy and Bradley Dredge – have yet to complete round three in the weather-delayed event. They will finish up at 8.30am local time (4.30am UK and Ireland), with round four starting at 6am UK time from the first and tenth tees. 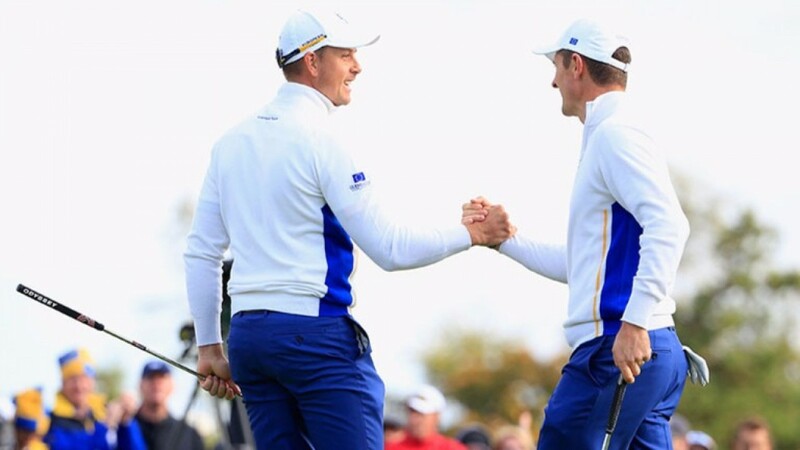 Sergio Garcia and Henrik Stenson have the European Tour to thank for getting them in such a dominant position. Their early-late tee-times over the first two days – which turned into early Thursday and early Saturday after the Tour quickly suspended play for strong winds on Friday afternoon – meant the pair played in calm conditions with fresh greens for the majority of their first 36 holes. Those in the other half of the draw had to battle in wind throughout and some observers have described it as the biggest draw bias since the 1985 Open Championship at Royal St George's. Garcia, who recently got engaged and cleared out his close-season rust with 11th place in the Singapore Open the week before last, has been enjoying every minute of this week. He has employed a conventional putting stroke for the majority of the event, but holed his final birdie with his old pencil grip on the 18th in round three. Garcia won the Qatar Masters in 2014, but he has never triumphed in Dubai, and his best previous finish in the Desert Classic is 11th place in 2009. Stenson opened his year with eighth place in the Abu Dhabi Championship, having arrived with almost no close-season practice under his belt. He has prepared much more thoroughly for Dubai, a city in which he used to live, and his knowledge of the Emirates Club is immense. Stenson won the Desert Classic in 2007 and has five other top-ten finishes to his name on the course. He has also won the DP World Tour Championship – the other European Tour gathering in Dubai – twice (2013 and 2014). Stenson is fresh from the best season of his career and a three-shot buffer may not be enough for Garcia to repel the Open champion. Both men hit their ball superbly, but this contest may boil down to the Spaniard's lack of conviction on the greens. Garcia is difficult to trust with putter in hand and could get even more twitchy than normal with such a high-class opponent staring him down. Stenson won one of the most thrilling duels in golf history at Troon last summer, seeing off Phil Mickelson to make a Major breakthrough, and hotshot Henrik looks much more likely to prevail in his Dubai head-to-head with Garcia than quotes of 9-4 imply. Ian Poulter has done nothing in the last 20 months to suggest he can upset the front two, while the others close to Garcia and Stenson are unattractive options, too. Tyrrell Hatton and Nacho Elvira have form in the book, but both are seven shots adrift. This looks for all the world like a Garcia versus Stenson shootout, with Stenson on offer at the value odds. The Saturday post-round interviews were particularly interesting, with Garcia sounding edgy and talking about trying to retain self-belief, while Stenson chuckled confidently about the challenge ahead. Despite the scores, Stenson looked like the man who expected to triumph. Calm, sunny weather is forecast for Sunday, with the fourth-round draw being made as soon as round three is completed.